I’ve said this before, but when Steve Jobs invented the iPad, I’m not sure he knew the influence he would have on special needs kids. Parents, teachers, and therapists are using the iPad and its apps for speech therapy, reading and writing, math, communication, and helping visually-impaired, deaf, autistic, and other special needs children communicate. Many apps are even developed by parents, teachers, and therapists, which gives them even more credibility because they live and breathe special needs with their children every day. 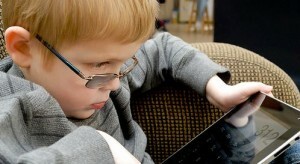 As a parent of an autistic son, we use the iPad mostly to build communication and language skills. I’ve listed some apps for visually-impaired children I discovered and hopefully, they will help someone special in your life! Children with visual impairment need apps that are bright, include audio, and are easily accessible. Cause and Effect Sensory Sound Box, by Cognable, for $1.99, includes bright images with audio. The great thing about this app is it’s so easy to use. Children simply tap a picture to hear the interesting sounds. When they remove their finger, it stops. Kids are learning when they touch it, a noise sounds, when they do not, it stops. The close icon is small enough so they are not constantly closing it. Like Sensory Sound Box, Sensory Light Box for $.99, is a simple app that uses graphics and sounds. Kids tap an image like Sore Tooth and hear a dentist’s drill. The sound varies, as well. If you move your finger at different points on the image, a different sound plays. For example, one of the sounds is a choir singing, when you move your finger up, they sing higher notes, when you move your finger down, low notes play. Both these apps are great for teaching kids with low tone how to hold their fingers on one spot. The Big Clock, free – A large interface clock with an alarm for visually-impaired iPad users. Dictation Calculator HD, $.99 – Speak calculations and it solves the problem for you. Talking Camera, free – Users take pictures of text and the app reads the text to you. Flesky, free – A touch-type app where users tap once lightly near the location of the letter on the keyboard, then swipe right for space. To change words, swipe down. Assistive technology switch interfaces are compatible with both of these apps. These are wireless devices that work with your iPad to connect keyboards, joy sticks, and other functionality helpful for special needs kids. These apps are compatible with Simplyworks for iPad, RJ Cooper iPad Switches, Ablenet Blue2, Cicadia PageFlip, AirTurn BT-105, and Therapy Box Switchbox. The iPad really has made such a difference on how the special needs community communicates. I am hopeful parents, teachers, therapists, doctors, and others take full advantage and continue to develop great apps for our kiddoes to use!